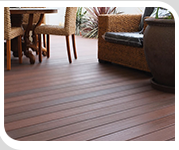 NexGEN Composite and Aluminium Decking is scratch resistant. Our patent pending surface technology sets the durability standard for outdoor decking with its unrivaled scratch resistance. Could outdoor living possibly get any easier? We doubt it.